crinklynose.com: I'm a Dead Meat!!!!! hahaha!!!.. yeah it's seriously expensive... BUT the worry and stress that it will save you is really worth it. just explain it to john. i think he'll understand you. hi florskie, heee... good thing he was ok with it. but i was super scared trying to figure out how am i going to tell him how much i paid for the thing. this is one of those situations wherein we gals can get away by using some charms... heee :o) tc dearie!! hugs! hope things are well with u. tc!! hay, what a relief that hubby is ok with it! i can imagine your nervousness (pausing to ponder about my latest bout with such uneasy feeling under a similar circumstance...hehehe!). pleased to hear that you've found a great solution to it. tell me what your kids think of it 'coz i'm curious. 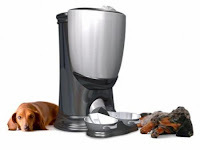 convenience wise, yep, i like this auto petfeeder. however, i realize i'm losing the quality i spend with them as they wait for me to give them their food. so we were thinking we'd train them to use it but then we'd not do it everyday. maybe only if we're going out of town or if we wouldn't be able to come home on time. we're still trying to adjust and figure out how to incorporate it to our daily routine so maybe we'd change our mind later on. but on the whole, esp the quality is superb! i've never seen anything like it. most of the auto feeder i've seen were wobbly and with a long list of negative feedbacks from previous users.